Imagine you are living thousands of years ago among our ancestors. Unlike many of your peers, you’re an outrageously optimistic prehistoric person, roaming the savannah feeling grateful to be alive. One day, in the middle of a hunter-gatherer mission, you pause and take a moment to look around and scan the scene. Over to your left, lurking behind a bush, you see an animal. You’ve never seen this animal before. It’s a lion. “Wow, what a fascinating creature.” you think. “I’ll head over there and take a closer look” . Perhaps the lion is friendly, in which case you may enjoy an interesting encounter. More likely, you’re mauled to death. For most of human history, cost-benefit decisions have favoured those with a pessimistic view. We may have missed out on some opportunities but in a threat-filled world, expecting the worst significantly increased the probability that our DNA would remain in the gene pool. A negativity bias in our thinking was adaptive. Fast forward a few millennia and our bodies and brains continue to be built according to much the same genetic load that influenced our ancestor’s predispositions. Our brains continue to operate in accordance with this negativity bias. Many forms of evidence suggest that ‘bad’ is stronger than ‘good’ as a general principle, across a wide range of psychological phenomena. Does the threat of illness motivate us to change behaviour? Unfortunately, while an effective way to avoid predators, our innate skew toward the negative does not seem to be very effective at motivating us to make good decisions in the modern world. We’re much less likely to be eaten by a predator, but chronic diseases, associated with poor lifestyle decisions, are an increasingly aggressive global killer. If you were diagnosed with a serious health condition such as heart disease, cancer, respiratory disease or diabetes, you might imagine that this would be sufficient motivation to change your behaviour. In 2012, researchers posed this question based on longitudinal data from 17,276 individuals. The primary focus was to investigate how patients behaved, before and after a serious diagnosis. After analysing the 12 years of data covered by the study, the researchers concluded that people rarely made positive changes in lifestyle behaviours, even after they had been diagnosed with a chronic condition. This is despite strong evidence to suggest that adopting a healthier lifestyle can extend longevity, reduce the likelihood of the condition recurring and enhance quality of life. Bad news does not appear to be an effective motivator for change, but still we persist in using a negativity bias to try to influence behaviour. Are there any other options? 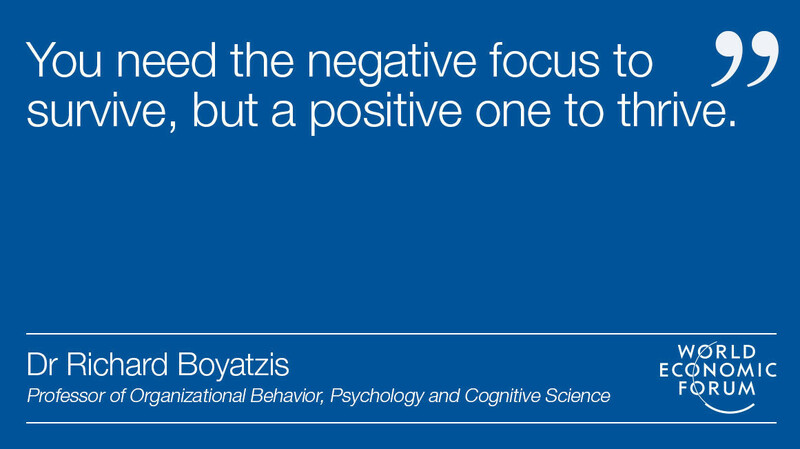 A solution to negativity bias? Dr Richard Boyatzis is an expert in the field of emotional intelligence and behaviour change. In 2013, Boyatzis and his fellow researcher, Dr Anthony Jack, collaborated on a study to assess contrasting coaching and mentoring approaches. The researchers divided a cohort of volunteers into two groups. Each volunteer was interviewed for 30 minutes on themes relating to ‘life coaching’ and performance, but the coaches who conducted the interviews used two contrasting techniques. Coaches asked questions that focussed on the problems and challenges the volunteers were facing. The coaches emphasised problem-solving techniques to try to identify solutions. This approach tended to bring up issues associated with other people’s expectations, weaknesses, obligations, and fears. Coaches asked questions designed to encourage the volunteers to imagine a positive future, such as how they would like their lives to look in 10 years’ time. The questions drew out the volunteer’s vision in more detail. Dr Boyatzis describes the coaching approach in group two, which emphasised vision, hopes and dreams, as “coaching and mentoring to the Positive Emotional Attractor (PEA).” This contrasts with coaching in group one where the approach is characterised as coaching to the “ Negative Emotional Attractor (NEA). ”After a period of five to seven days, both groups of volunteers were asked to return and answer a series of follow-up questions by the same coach, using the same approach as in the first interview. During this second round of questioning, the students' brains were scanned using fMRI, a brain imaging technique which detects changes associated with blood flow, to measure brain activity. The results demonstrated that the two contrasting interview approaches activated different and distinct regions in the brain. The Negative Emotional Attractor approach, which emphasised the problems over the vision, activated the sympathetic ‘fight or flight’ nervous system and regions of the brain associated with blaming ourselves and experiencing negative moods. When we experience NEA, our sympathetic nervous system becomes more dominant. Physiologically, heart rate and blood pressure increase, but we are also more likely to make decisions based on fast, instinctive, but sometimes faulty, shortcuts in our thinking. We are more likely to be fixed, rather than flexible. The difference in brain blood flow between the two conditions points to an underlying mechanism that may help to describe why the Positive Emotional Attractor approach is more effective. In the study, it appeared that coaching and mentoring to the PEA resulted in activation of regions in the brain associated with developing a plan or vision for the future. When we focus our attention on positive themes, reward circuits and areas of our brain associated with experiencing positive moods activate. In addition, our parasympathetic (rest and digest) nervous system becomes more dominant. When we reduce our perception of threat, our mind may consider that it’s safe to take more time over decisions and think more deeply. We become more cognitively flexible, able to simulate multiple future possibilities and consider new ideas, as well as taking into account how other people think and feel. These patterns of activity are vital for motivation, sustaining positive feelings and keeping going when we experience challenges – characteristics that are crucial if we are trying to change our behaviour and work towards a goal. Coaching and mentoring that encourages us to imagine a positive vision of the future, focussing our attention on possibilities and dreams has been shown to enhance behavioural change and increase the likelihood that we will achieve what we are hoping for. That’s not to say that we should ignore problems entirely. Rather, consider the starting point when you next begin to think about a new challenge or opportunity. Will you begin by listing the problems and threats, or take a step back, make a conscious challenge to your negativity bias and make your starting point a vision for a more positive future, characterised by growth, learning, development and possibility. Evidence suggests this may be the most effective approach; unless, of course, you are staring down a lion.